DJ Patrique in the mix! I talked about that before, and finally I have it: A brand new shiny mix by DJ Patrique. It’s minimal, it’s funky, it’s soulful, it grooves. You start listening and might think, “well, this is nice summer house music..” but wait until it starts hypnotically screwing its sawtooth synths into your ear. Hands up on the dancefloor guaranteed. With selected records by, amongst others: Audiomontage (Freerange), Steve Bug (Pokerflat), Samim&Michal (Freizeitglauben), Phage (Highgrade 31): Contemporary Berlin house music, just the style I love. 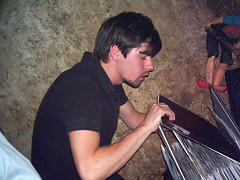 DJ Patrique plays in different clubs in and around Berlin. He is playing records for ten years. He is part of the Stylewalker-artists.